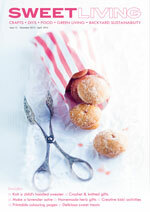 We’re flat out working on the next issue of Sweet Living – and it’s a goodie. Lots of party ideas for adults and kids; a host of cakes and cookies to make; toys to crochet, knit and sew; heaps of free printables; and the low-down on planting a mini orchard. It’s coming very soon, so watch this space. Looking forward to all your new goodies Hugs!